I’m an absolute sucker for vintage embroidered linens, especially linens embellished with whitework embroidery. I don’t collect a lot of them, but what I do have, gets used. A lot. I figure if you collect something just for the sake of having it, but not for the sake of using and enjoying it, what good is that? After all, those gorgeous vintage linens that were meticulously hand embroidered by someone, somewhere, at some point in time – well, they were made to be used! They weren’t made to be stored in a drawer or a box forever, to eventually make their way into an attic or… woe is me… a garage sale or a thrift store. But they often go that route, don’t they? I think if they were used more – instead of stored away for safe keeping – they would be better appreciated by all who saw them, and they would be treasured by family and friends. They wouldn’t end up cast away at a thrift store. But I also think many people don’t use vintage pieces and end up getting rid of them simply because they don’t know how to use them and how to take care of them. If you have a collection of vintage embroidered linens, and if you love them, you should use them. You should derive the pleasure from them that they were intended to give. When considering what to do with a vintage linen, consider it for what it is. It is a useful object. A beautiful object, yes – but first and foremost, it is a useful object. A tablecloth covers a table. A pillow case covers a pillow. When considering using your vintage linens, don’t hold back on what to use them for! If they’re in good shape, use them for their intended use, despite the fact that they might get dirty or stained. You see, linen is an extremely resilient fabric. It holds up to all kinds of wear and tear, and it holds up to laundering magnificently. In fact, linen becomes more beautiful with use and with laundering. So, if I’ve halfway convinced you to use your vintage linens – and if you’re ready to break free from the fear that keeps your beautiful linens in a closet – here are some practical points that I’ve discovered through years of using old, gorgeous whitework linens that have held up like a dream. If your item is delicate or damaged, consider where and how you’re going to use it. Occasionally laying it out as a decorative piece where it’s not subject to heavy use, but will still be seen and enjoyed, is a better option than putting it to heavy use, or leaving it forgotten in storage. You have a delicate table cloth or table runner? Put it on the table for decoration when you’re not using the table. Remove it when it’s time to eat. A whitework pillow case that’s wearing at the seams? Use it on a decorative pillow for a bed (like you would use a sham), taking the pillow off the bed at night. That lovely wedding hankie from days of yore with a fragile edge? Consider using it as a doily on a decorative table, where it isn’t exposed to direct sun or to food & beverages. Occasionally switch out these linens for cleaning. Store them for short term, and decorate with them again in the future. By hearty linens, I mean linens that are intact, that still have body to them, that are not fraying around the embroidery, and so forth. For these types of linens, use them as they were intended. Sleep on the pillow cases (have you every slept on an old linen pillow case that’s been freshly cleaned and aired? It’s luxury!). Dine on the tablecloths. Serve tea on the tea cloth. Put a vase of flowers on the doily. Hang the monogrammed towel in your guest bathroom for friends to dry their hands on. Before you use a beautiful old linen, if it needs pressing, press it and make it presentable. After all, you want to show it off in all its glory! Assuming that the linen is clean (that it was put away clean and it hasn’t developed any strange stains or spotting), this is how I go about pressing a table linen. Test the iron to make sure no water drips out of the steam vents. Make sure the plate on your iron is clean. If you need to clean your iron, use a vinegar-soaked paper towel to wipe the plate clean. If the plate is really bad, you might have to soak it for a while, by sitting it face down on a paper towel soaked in vinegar. Just make sure the iron’s off when you’re cleaning it! Pad your ironing board with something soft. When ironing embroidery, you need more padding than the cover and regular pad on your ironing board will provide. You can read all about ironing embroidered linen here, including tips on what I use to pad my ironing board. If you’re ironing a large linen – a tablecloth or anything that will hang onto the floor – lay a clean sheet down first. You can also line up a couple chairs and feed the ironed linen onto the chairs to keep it off the floor and straight. I usually just lay a sheet down and let the linen fold gently onto the sheet as it comes off the ironing board. I always use distilled water when ironing my embroidery or vintage linens. It probably won’t ruin them if you don’t use distilled water, but I just prefer it. Use a spray bottle, and mist the linen well all over. Alternately, if you are not ironing right before storing them for a long time, and if you plan to launder the linen after use and before storing, you can also use spray starch. Linens should not be starched before storing them long-term, but they can certainly be starched before they’re put out for use. Use the “linen” setting on your iron. Keep the iron moving – don’t hold it in one place for any length of time. If you notice that it seems too hot, cut back the heat. Don’t risk scorching! Let it soak for a little while, and then launder it. If the stain doesn’t come out after you’ve used this kind of stain remover, don’t dry the linen. Use some of the tough stain removing options below before drying the linen. 2. Laundering: Assuming again that we’re talking about hearty linens with white-on-white cotton or linen embroidery, you can do one of two things: wash them by hand or use your washing machine. If I’m laundering something that sports needlelace, cutwork, fine crocheted lace edges or anything like that (like the linen in the photo directly above), I prefer to wash by hand. If I’m laundering something that just has a little bit of simple embroidery on it (like the cloth in the first photo in this article), I’ll use the gentle cycle on the washing machine. For detergent, for regular cleaning, I like Oxiclean (as long as there is no silk on the embroidery), or even Tide or liquid Biz or the like. I normally start the water in the machine, add the detergent to the water and agitate it, and then add the linen. 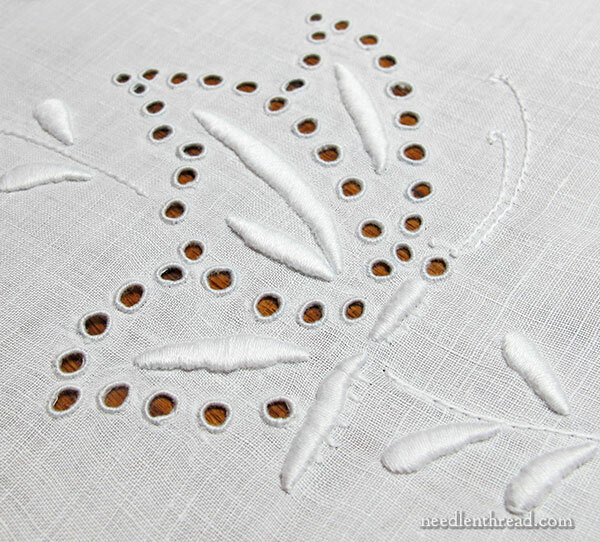 I use warm water for white linens with whitework embroidery. I wash vintage linens separately, and never with colored items. There are different products and different approaches that can take out discoloration and tough stains on vintage linens. Some approaches depend on the situation. If you’re desperate and at the end of your rope with a stain, you might have to take extreme measures to remove stains. Again, treat any stains that occur on your linens as soon as possible. First, if the stain didn’t come out with a spray-on laundry stain remover, try soaking the stain with concentrated Biz. You can also use a concentrated Oxiclean paste or the like. With liquid Biz or with an Oxiclean paste made by mixing a bit of Oxiclean with a little water, you can rub it right on the stain with a clean, soft toothbrush. Leave it half an hour, and then rinse thoroughly. This usually will take care of any tough stain from normal usage, like food, wine, coffee. For smaller cloths, if the stain doesn’t come out with the above approach, try boiling the cloth in a large pot on the stove for 20 minutes. You’d be surprised how much residue boiling water will remove from linen! You can also add a couple teaspoons of cream of tartar to the boiling water, to help remove the stain. This works especially well with red wine stains. 1. Lemon juice & salt: Squeeze fresh lemon juice all over the stain to soak it. Then sprinkle it liberally with salt, and rub it in gently. Let it sit a while (20 or 30 minutes) and then rinse the area with vinegar, followed by warm water. Make sure you rinse really thoroughly. 2. Diluted bleach solution: dilute a tablespoon or so of bleach in a cup of water, soak the stain in it, and if you need to, scrub it with baking soda. It’s not the best solution in the world – it can really take a toll on the fabric fibers – but if there’s nothing else you can possibly do to get the stain out, use it as a last resort. 3. Rust Stains: For rust stains, there’s a product called Whink that works on whites and colorfast fabrics. It’s a pretty heavy-duty cleaner, but in cases where your linens are rust stained for some reason, and you don’t have any other option, follow the manufacturer’s instructions and try it. For discoloration from age or storage, I like a product called Restoration, by Engleside Products. I’ve used this to remove yellow age discoloration, stained folding marks, and the like, with very good results. You can follow the manufacturers directions for using the product, but essentially, you fill a bucket or tub with water and about 3 scoops of Restoration per gallon, and soak for several hours (even overnight). Check it after five or so hours and repeat with fresh solution if necessary. You can dry your linens different ways. For small pieces, you can lay them flat on a clean towel and let them air dry. For larger pieces, you can put them in the dryer on a gentle cycle and dry them until mostly dry. You can also hang them on a line outside and let them dry outside in the breeze. I like doing this with pillow cases and sheets. If you’re going to iron, don’t let them dry completely. Before long term storage, I like to iron my linens first, while they are still somewhat damp. If I’m going to iron before storing, I don’t let them dry all the way. I iron them until the wrinkles are out and they are dry. I like to leave them out on a bed, sofa, or table overnight before folding or rolling them for storing. That way, I’m sure they’re completely dry. I never use spray starch on linens that will be stored for a long time. For linens that are stored short term (I plan to use them at some point in the next year), I don’t mind folding them. For linens that might be stored a year or longer, though, I like to roll them around a sturdy left-over gift paper tube or mailing tube that’s been covered with white acid-free tissue. 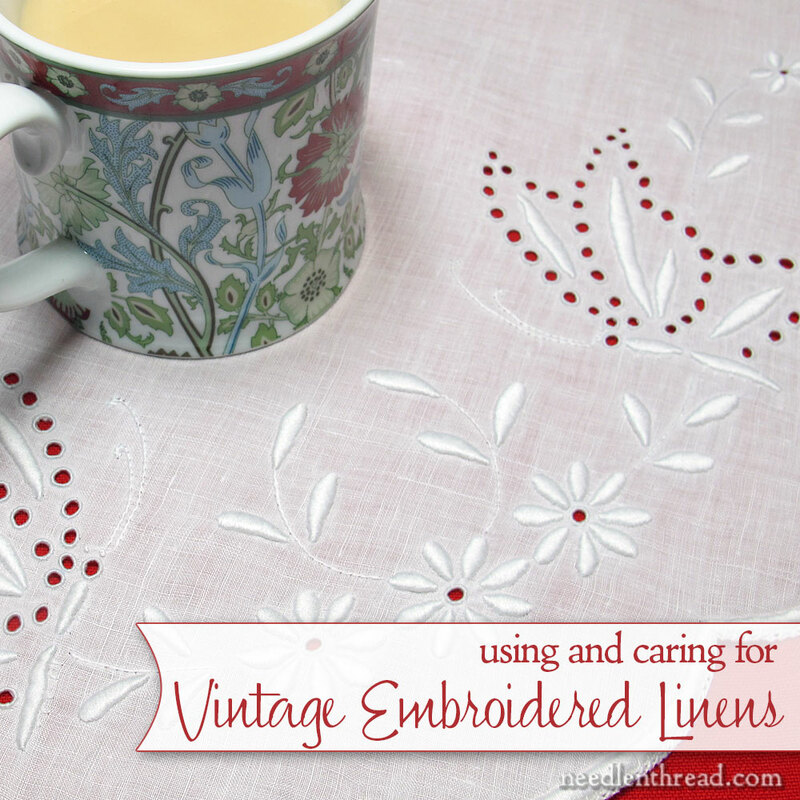 Do you have any tips to share about using and caring for vintage embroidered linens? Do you have any vintage linens yourself? Do you use them, or keep them safely stored? If you use them, how do you use them? Any encouraging words to help others take their treasures out and enjoy them? I’d love to hear your thoughts, suggestions, tips, and so forth! Feel free to join in the conversation below! February 19, 2013 Vintage Linen: Circular Crochet Edging – a Free Pattern! Mary, this is a terrific blogpost. I’m definitely saving these tips for future use. I do believe in using handmade items, and have rescued crocheted and embroidered pieces so as to put them to use again. Lovely old crochet under glass on the coffee table and side table, or made into small curtains for bathroom cabinets, old small teacloth on the night table, that kind of thing. Easy to do and a nice decorating touch, too. But I have to admit to visitors it’s not my work they’re seeing! Years ago the best remedy I knew (we all used it) for removing stains on fragile fabrics or making yellowed-with-age garments look like new was to mix Ivory Snow flakes with powdered Snowy bleach. That mixture (2:1, I think mixed in water.) It was like magic. Never harmed the fabric. Always worked. Now those two products are no longer available. I’ll have the try the product you recommended. Guessing maybe it’s the same active ingredient? Certainly worth trying. Happy to know about it. Thanks. I learned that recipe from Marion Scoular years ago. She said they were good because the Ivory Snow was a soap, not a detergent. I got a box of each and kept a jar of the dry mixture handy. The formula for Ivory Snow changed long ago to a detergent. I still have the last of my mixture. I’m not sure what I’ll use going forward. It is wonderful and I’d love to find an alternative. I do believe you can take a bar of the original Pure Ivory Soap and grate it, to the same end. I’ve done that – it works! It looks like Ivory and the like have added chemical detergents to their soaps, so whether or not you want to use them is up to you. If you want pure soap flakes, this stuff sounds really good! I’ll be ordering some and testing it…. First, I don’t know what sort of soap she might have used, maybe homemade, but since she is writing into an urban newspaper maybe she used Ivory or some other commercial soap like the old Fels Naptha? Then, it couldn’t be done with large or fragile items, unless care was taken when hanging. I’d be interested if you or anyone else on here has ever tried something similar? Sunlight is definitely a bleacher! 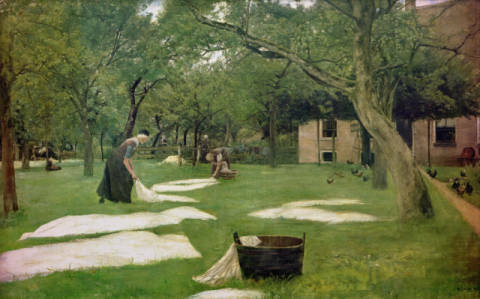 In the past, I know white linens would be washed and left out on green grass in the sun to dry. Something about the combination of the sunlight and the chlorophyll that would whiten them….there’s a painting, I believe it’s Dutch? (could be wrong on that), that depicts a whole town of ladies with their linens laying out on the town green, whitening in the sun. I’ve never heard the jar trick, but I would imagine it would work…. Great tips and information, as always! Aaaaah! Beautiful! No, that wasn’t it – it was a whole town square, almost from a bird’s eye view. But I LOVE that one – I don’t think I’ve seen it before. Thanks so much for posting the link! I do have several pieces of vintage linen. My kitchen table has a finish on it that protects it from dampness. This finish allows me to wash the linen and put it on the table to dry. By smoothing the damp linen in place it dries looking pretty nice. This method works for a kitchen table as the linen is not perfectly smooth…a bit of a shabby chic look, maybe not for a formal dining room table. My favorite vintage linens are napkins, I find them often at yard sales as they are thought to require ironing. I use them everyday as napkins, hand towels and when they are tattered or stained as cleaning cloths. Kept on the countertop, folded in my grandmother’s mixing bowl they become decorative as well as very useful. Use them, we do, most everyday you can find a stack in my laundry. For stains on the tablecloth, wash the tablecloth and take it out on the lawn early the next morning and allow the sun to dry and bleach the cloth. My grandmother taught me this, something about the dew on the grass and a day in the sun that removes the stain. Whatever it is, it works! Once the stain is removed another quick wash and back on the table it goes. As a lover of old linens – especially REAL linen linens, I really appreciate this post. And yes, I do use my linens when possible. But one thing I have to point out is that ending up in a thrift is not the worst thing that can happen to an old piece…after all, that’s where I’ve found most of mine! Yes, it sort of ‘hurts’ to realize how little the market appreciates the labor of foregone generations – but it means that I have been able to afford to rescue some lovely work and hopefully treasure it as much as its maker. True, true, Elisabeth! At least they’re going to someone who wants them! I am all for using hand embroidered items, but I can say from experience that they are not in any way indestructible. The first long term project I embroidered at about age 11 was a pillow case. It no longer exists. It was DMC cotton and a blank pillow case that I ironed the pattern onto. After a couple of years of use, and regular washing (regular laundry soap), I put it in the laundry, and when I took it out of the dryer, the floss had disintegrated. It was so worn, from so much use that the lint screen in the dryer had more floss on it than the pillow case. That also happened with a night-shirt (pajamas) that I embroidered about the same time, I literally wore it out. I was heartbroken, and have not embroidered a pillowcase, clothes or anything that needs to be washed frequently since. I have done a few table cloths and decorator cushions because they are washed far less often. I am not saying that people should not use their vintage embroideries, I am just giving people a heads up. RMW – I’m glad you got so much enjoyment out of your handwork. I do have to wonder if the pillow case and nightshirt fabric may have had polyester in them. I have some pillowcases Mom embroidered years ago. The poly-cotton blend pillowcases shredded the cotton floss, the all-cotton pillowcases still look good. In my case, it was simply the fibers in the fabric were stronger than the fibers in the thread. Also, it *seems* like the smaller the stitches, the better the embroidery holds up to laundering. At least in the poly-cotton pillow cases from Mom, areas with smaller stitches lasted longer. JGail: No, my family has always specifically avoided polyester in most things. In summer it often is over 100 and always over 95, so cotton is our favorite. The only person here who wears polyester is my dad in his office-suits. Those do not come in cotton, but his shirts for them are cotton. Also, polyester items have more “rules” regarding cleaning, so the vast majority of what we wear/use, even today, is 100% cotton. When I over-washed the pillowcase I wondered why it happened and learned about lint. I learned that no matter what, when fabric is being washed (or worn), the items rub together and fibers loosen from the thread or fabric and wind up in the lint screen, shorter fibers take less time to loosen, but even if the cotton fibers that make up the fabric/thread are long, they will slowly break and eventually work their way into the lint screen. That is why fabric that is used frequently thins and thins and eventually develops holes. Like pants, eventually, from everyday wear, the fabric between thighs develops those “pills” and those eventually become holes, because the walking speeds up the fiber damage, in the washer and dryer it takes longer. What a great set of tips, Mary! The only thing I would also suggest is that soaking the pieces for a looong time (more than 24 hours) also does wonders. I have seen friends just soak and rinse for a couple of hours — and the stain remains. But soaking for a couple of days makes a huge difference!! something about super-saturating the fibers….. thanks, again!! Yes, true – for the super soiled, you can soak them for days. I soaked one for five days once, because I forgot it. Came out pristinely white! I’ve found when soaking for a length of time, it helps to put the item in the refrigerator. Keeps it from going “sour” as my mom said. She’d also sprinkle her linens and put them in the refrigerator before ironing. Then if she didn’t get to it that day, they wouldn’t mildew before she could. You may know about this lady, but I don’t recall you ever mentioning her. She is a quilter (which I know you’re not), but what she does with old linens, especially those that are damaged is amazing. http://blog.cindyneedham.com/ I am intrigued with taking older linens, whole or part, and making them usable again. Some of what she does takes it beyond being usable in my opinion, but does turn them into beautiful works to behold. Thanks for the link to Cindy. Her ‘repurposing’ is gorgeous. As a crazy quilter, my fave old linens are the damaged orphans. I positively pounce on beautiful old pieces with holes, tears, stains and random embroidered chunks. After I pet them and reassure them that they are still loved and appreciated, they are used as featured embellishments in my CQs. Hanky corners, crocheted edgings, and embroidered whitework motifs are cherished additions. It sometimes takes bravery to make thefirst cut, but many a special, wounded treasure has gained new life this way. Send me your tired, your damaged, your huddled masses of ”ususables’ should be my motto! Hi Mary, great article! Makes me want to take out all my treasures and use them. I have a large collection of vintage hankies. Any ideas on how to display them? I use them underneath, for example, a statue or a vase, on a small table – using them like doilies. If you have a few that are similar in size, you can turn them diamond shaped and line them down the middle of a table, as a centerpiece like a runner, only not a runner! Oh, this is perfect! We just received some old linen from my cousins who cleaned out their parent’s house! Some of it had been embroidered – but only started, not finished. So I get to play with using this fine old linen and making something new or finishing what was started. Thank you Mary! Je réponds à votre demande sur le linge vintage. J’ai en effet, des draps et des chemises de nuit brodés par ma Grand Mère. Les chemises sont trop petites quant aux draps, je m’en suis servi pour faire un rideau dans la chambre à coucher, les autres sont enveloppés dans du plastique et dans l’armoire. Son service de table damassé brodé également par elle, fait partie du lot et est dans l’armoire. Je n’ose m’en servir. Parfois il m’arrive des les regarder. Je ne sais pas s’ils serviront après moi, les jeunes ne connaissent pas la valeur sentimentale et les heures de travail que lui ont couté ces merveilles. Another terrific post today. I’m an avid collector of vintage linens for their beauty, history, craftsmanship and because I love to learn from and examine the sewing stitched. I love to have my vintage pieces around my home. I think of the stories they could tell–the laughter and tears shared when stitched by their original owner in their sewing circles of friends. Restoration should be used with great caution! I had used it many times on a variety of embroidered pieces with success. But I finished the needlework on an old crewel piece I had started as a teenager, an Erika Wilson kit of beautiful forest animals. It had become soiled over the years and I decided to use Restoration on it. It BLEACHED about a third of the color from the yarns and my project looks terrible now. I would have been better off to have framed it uncleaned. It is so bad I have actually considered using carefully watered down fabric paints to brighten it back up to a decent color. Test Restoration with a snip of thread from the back of the work on a wet white paper towel to see if the color is left on the towel before trying this project on something special. Restoration should probably not be used on colors, in general. 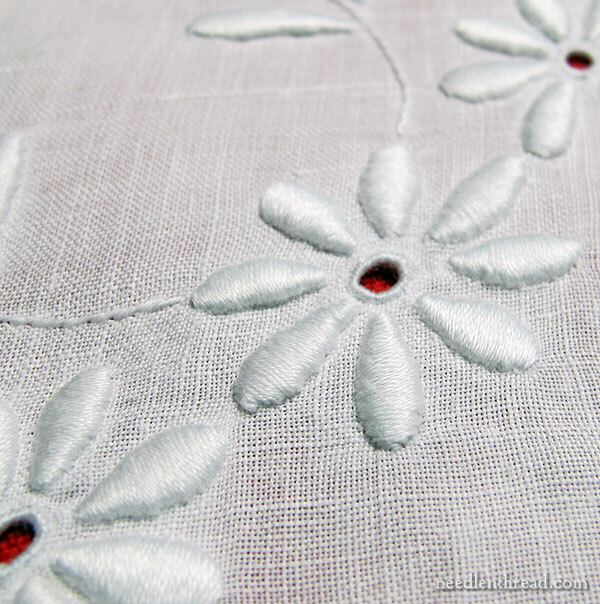 I’m pretty much talking about whitework embroidered linens. I probably wouldn’t use it on wool. There are special cleaners out there for wool. I think Wooly Thread carries a wool cleaner, or at least, they’d be able to direct you to one. Anything that is a whitener and brightened, I wouldn’t use on colors without careful testing on something non-precious. I have to say that you have been hitting home runs with your posts lately. It seems as though every day for the last week or more I have read something that is REALLY helpful–this post included. I am so grateful for what you do. Couldn’t agree with you more on the subject of using one’s vintage linens. Not quite what you were talking about, but, currently, my husband and I are sleeping beneath a Welsh whole quilt, circa 1890s – 1910s. It’s quite a thin quilt, but, I believe has a wool interior, which makes it very light and very warm. This, together with a sheet, is all we need. It’s also very beautiful! Absolutely! And you can actually leave it there for as long as you need to, if you can’t get to ironing it right away. When you take it out of the freezer, though, leave it out for 15 or so minutes. Sometimes, if the linen is put in the freezer too wet and is in there a long time, it will freeze hard, and it can break. So just let it sit a while to thaw a bit, and then iron. You get an awesome smooth sheen on the linen this way! I will surely try this. It seem great! Thanks for all the great info. I would also like to add my experience. I once re-discovered my mother’s old linens. They were basically unstained but terribly yellowed. I did an internet search on how to restore vintage linens and was surprised to learn the following: Soak the linens in plain, cold tap water, periodically changing the dirty water . Make sure the fabric is completely covered. You may have to soak over a period of days until the soaking water is clear. If after soaking over a period of days, the water is clear but the textile remains yellowed, hang in full sun to dry. I followed the instructions and the results were amazing! The tablecloths were incredibly white and bright after treatment and I didn’t use anything but water. I have recommended this to many of my friends – 1 friend did this with a vintage red work quilt after ascertaining that the red fabric used in the sashing and the red embroidery thread didn’t run. It’s the gentlest method you can use. You must remember, however, that fabric is weakest when it is wet; so you must make sure you support it when changing the water; don’t wring or twist it and don’t let it hang from clothes pins outside when it is soaking wet. Mary, Thanks so much for this great article. My small collection of vintage linens are my pride and joy and I loved hearing these new tips for cleaning them. I use Biz quite a bit, but didn’t know about boiling them! This is something I really want to try on some difficult stains. I’ve used a “Biz bucket” quite often, and want to add that I’ve let things soak for a week or longer before, and was amazed at how this removed tough stains. The water needs to be changed every day or two, but eventually most stains are gone after a long soak. This was a wonderful post and I am definitely keeping it. There are two things that I would lie to add. When you have washed your linen tablecloth and napkins and you just don’t have time to iron them then you can put them wet in your freezer for storage. You just food them up wet, put them in a bag and put them in the freezer. It keeps them from mildewing and they iron beautifully when they are cool. You can also iron them at your own pace. I have also used sodium perborate powder to soak stained linens, fine baby clothing, etc in. Hi, Karen! I always enjoy seeing what you’re up to – I don’t always comment, but I definitely stop by every day or so! So fun to see your work! LOL! No, no need to tidy up! It’s fun as it is! I wrote you yesterday about handkerchiefs. I might monogram my husbands but I use too many in a week and wear them out too fast to do that with mine. I have allergies 10 months out of the year. I usually buy vintage lots of handkerchiefs on eBay. That way I usually get finely woven soft cotton ones, beautifully embroidered linen ones, ones with tatted edges, ones with crocheted edges. I will buy large lots that for some reason, usually a couple of ugly handkerchiefs are on top of a pile, no one is bidding very hard on. Over the years I have gotten some gorgeous ones this way. Because I use them, a number have at a wash suddenly become quite frail. The first wash I see that they are removed from my handkerchief drawer and put in an acid free box in my sewing room. I had enough build up so that I was able to iron them onto a white cotton voile with an applique adhesive butting up all the square edges and layering the circle handkerchiefs over a four corner join up of larger handkerchiefs. When I was through making my new material I used crazy quilt stitches over all the “seams”. I couldn’t sew the handkerchiefs with a machine at first as they were too fragile. By affixing them to the voile I strengthened them. I have enough “material” to make into curtains for our guest bedroom. It will make a light airy curtain even though there is two layers of material. I used some of your stitch fun stitches on the seams also. I also have quite a bit of handed down vintage linens. They do indeed get used. I like to use them especially when my 7 and 3 year old grandchildren are here. They are perfect conversation starters….Your great-great-grandma used to use this on the table when I would go over….. I also thrift old linens. On an earlier post, I have no idea how long ago, you had mentioned using Orvus for discoloration and stains. I take it you no longer use this? I’m just wondering why as I have been using it per your recommendation. Am I hurting my linens? Hi, TerriSue – I use Orvus, too. I mentioned Restoration because I’ve gotten such good results with it for removing discoloration, and in a shorter amount of time (or so it seems…?) than with Orvus. But Orvus works well, too. When discoloring is extreme, you can soak a linen in an Orvus / water dilution for days and days and days (changing it out every day or so) without any fear of damage. Eventually, it’ll come white again! I recently discovered the Engleside “Restoration” powder and I think it’s great! I’ve had excellent results on crochet doilies and trims. I also use it to soak brand new white cotten tea towel fabric to remove its surface chemicals. The only thing I recommend is to thoroughly rinse the item in cool water.I then put my fabric up to air dry. When dry, the white cotten comes out with a classic cotten feel and its perfect for embroiderying. Love this website and all your tips. Even embellish them with monograms for gifts. I have found tablecloths with wonderful cut work – a little stained or torn. Do repairs and place over a red table cloth for the holidays. I remake some for lingerie bags when traveling. Cut damaged ones up and use as trim on plain sweaters or jackets. The website The Laundress? Super wonderful laundry products for delicate items. Vintage linens or doilies with unremovable stains or tears are perfect candidates for use in crazy quilting. One can cut around a stain and just use the pretty parts, or add a button or embroider a silk ribbon motif over the stain. Doilies will often have beautiful lacy edges that can be tucked under a patch and embroidered down. I once used a doily that looked like it had been caught in greasy machinery in 10 different CQed projects. I love vintage hand-embroidered linens! I have a decent collection of hand towels that I display on a tension rod above my bathtub in my main bathroom, like a valance. Something beautiful to look at! I also love vintage tablecloths and use them all the time. I always have one on my kitchen table. Yes I agree that embroidered linens old and new should be used and displayed for all to see because of the time and effort put into these embroidered items they should be shown. A very informative and useful article with lots of tips and techniques on how to care for linens and I will be following your advice on the care and storage of linens. Thanks so much for sharing your advice on how to clean, iron and store such beautiful riches, this is very helpful. I love antique linens also but my favorite use is to turn them into quilts. Tablecloths make great wholecloth quilts which can be used or displayed on beds rather than stored in drawers. I have made them up into twin, full, and queen size quilts. Smaller linens make lovely wall hangings – I have even used pillowcases where I slip the batting inside, quilt, and then hand close the opening. If you do not quilt, you can find a machine quilter in your community. Part of the fun and challenge is to quilt in a design to complement the cutwork, embroidery, lace, etc. If there is cutwork you do have to use a fourth layer of fabric to prevent batting from coming out through the openings. I have preserved two family heirlooms in this manner and countless other collected linens. Excellent article Mary. I agree, use your linens. I am a vintage and antique linen dealer and you are spot-on in your advice. I would also like to add a few things to the discussion. First, I use Oxi-Clean to soak almost everything! I would probably be out of business without them. Conservators caution us against using some of the old methods of cleaning because they are tough on old fibers. Most of the collectible linens today are approaching 100 years old and beyond so the days of leaving them in the sun to whiten and bleach are about gone. Light, humidity and temperature fluctuations are the main things that damage old linens and we can control them with proper storage. The main thing is to keep the fibers away from direct contact with wood or wood products (like tissue or cardboard that is not buffered) and allow air circulation when possible. Launder at intervals to keep the mildew in check and don’t store long term in plastic sealed containers. Finally, even damaged or torn pieces can have new life when used to make keepsakes. Don’t feel bad about cutting these items up- they live on in a new form and are always pleasing to the owner. Thank you for encouraging people to use their vintage linens. I always do. Unfortunately, it isn’t all linen, so my cotton pillow cases with the tatted lace that my grandmother made have fallen apart, but the lace is still good, so I am likely to reuse it. I am always wondering what people do for dresser scarves if they don’t actually use these beautifully enbroidered pieces. I have an old house (1850) so the embroidered pieces go perfectly. I wouldn’t know what to do without them. Certainly all my furniture would get ruined. Now–any advice on how to get my husband to stop playing “mole” with the cats. The quilt on our bed is starting to get holes in it from over enthuseastic mole diggers and I would like that to last a long time! Yes, yes, yes! Use those beautiful items. I do many fiber-related crafts, including weaving, and it drives me nuts when I make a dishtowel or whatever for someone and it is put away as “too good to use.” I think it honors the makers to use and care for the items they made. By the way, it has been my experience that hanging linen tablecloths rather than folding or rolling them, actually leads to more wrinkles. This might be because they are not stabilized by the pressure of layers and gravity with temperature and humidity changes. So, I’m back to folding and rolling. Thank you so much for this great article. When I married in 1975, my paternal grandmother gave me what was fondly known as a “hope chest” – it was full to the brim of hand made linens for my new home. I still use most of those today. I was also the only one who wanted all the rest of her “stuff” when she passed away many years ago. I have always carefully used it because I never knew just the right way to care for it. This is so much help especially as some of them are truly getting a bit worn at this point. Such beautiful accents to our home, I just love them all. As my Gran used to make the crotchet lace doilies etc for Heals of London, in her spare time I grew up with a general disregard of “precious” linens! They all went into the normal wash – she made no distinction. BUT she carefully starched and ironed every one, with the folds in all the right places. So yes I use those left to me, and the ones I finished off for her. And the ones I finished embroidering that my Mum left in the “dugout shelter” again to act as VAD nurse amongst the London rubble. Its usually the embroidery that wont stand the hot water. Do you remember the good old “dolly bag” of a blue dye and washing soda or bicarbonate? Thank you, thank you for this post!! I have many linens handed down from my grandmother and they are in a drawer. Time to retrieve them! Great article. I collect cleaning tips and there are so many in the article and comments. Unfortunately I don’t have a green grass lawn on which to layout pieces. Maybe I can put up a temporary clothes line to take advantage of the sun. For blood or other stains that respond to cold water, i use Shout and put the article in a bowl of ice cubes. Sometimes I rub the stain with the cubes. By the time the ice cubes have melted, the stain is gone. your tips and suggestions for vintage embroidery are very usefull and I quite knew some of them myself since I love vintage linen items and use them also. I am sure that the embroiderer who Spent so much time and efforts to make these wonders would not at all be happy to find out that no one ever sees them and appreciates them. (i would think the same) So I use them as you suggest and an very proud to show them off. I would just add one procedure to the many hints you have shared with us as regards to yellowish timed linen items. Melt a big chunk of baking yeast (the one bakers use to make bread) in a bucketfull of hot water and then let your linen soak in it overnight. You can then wash it by hand with Marsiglia soap and rinse it many and many times. I would also suggest to lay the item flat in the morning sunshine if possible. I think this type of procedure can be used for not so large embroidered items and those that do show their age. I myself have tried it with an old and delicate tea cloth which was rather yellowish around the foldings and the result was surprising. Bread yeast, marsiglia soap and morning sunshine are delicate and could save the day. I have a few tips for vintage linens. First, when washing, them, rinse, rinse, rinse. I’ve found that scorching often comes from cleaning products being left in the linens and not necessarily from a hot iron. Second, I’ve found that the Carbona Stain Devil products work really well to remove tough stains. These come in small yellow bottles, and each is directed at a specific type of stain. I’ve found them at Kroger and Walmart. I especially like the one for juice and red wine. Third, if I’m going to use a tablecloth immediately, I set up the ironing board at the end of the table and feed the ironed portion of the cloth onto the table. It stays clean and unwrinkled. Fourth, I have a not-too-valuable tablecloth I always use at Christmas. I always iron this one as soon as I wash it, fold it in thirds, and hang it over a cardboard drycleaner’s hanger. This way, it’s ready for use. My friend gave me this tip when I was newly married, and I want to hug her each holiday season when I have one less task during that whirlwind time. I hope these help someone else! I absolutely use my collection of vintage linens but you’ve given me some new ideas for uses (i.e. handkerchiefs). Thanks for your beautiful site and wonderful ideas. I look forward to your blog everyday. I have a lot of vintage linens and use mine all the time. Embroidered towels hang on the rails of my baker’s rack. Doilies are all over the place. I have a set of fine thread doilies that were my grandmother’s. They are in use inside a china cabinet with one of my Nancy Ann dolls standing on each one. A fancy Victorian dresser scarf covers my husband’s piano top. It has a matching half round table topper that I have placed round side up on the back of the slipper chair in my bedroom. I welcome any opportunity to display a piece. I have most of them stored by seasonal colors or motifs in a drawer in extra large zip-lock bags so they can lie flat, ready for use. without ironing. I just finished another quilt out of recycled antique linens. The owner wanted them appliqued onto a bed-sized quilt so that they could be laid out and used for the family to see. If the linens are too frail to use as intended, this helps to give them a new life. By appliqueing instead of piecing them in, I have also been able to preserve much of the hand crocheted or tatted lace around the edges as well. My grandmother, Sarah, embroidered two dozen damask dinner napkins. After she died, half went to my father and half to his sister. Mother used them regularly, cycled in with some that came from her mother, so each napkin was used — and stained, and washed, and run through the mangle to iron them — every 2 or 3 months. When Mother died, they were still in good condition, so I gave them to my sister-in-law because I knew she would actually use them. Aunt Louesa, on the other hand, washed and pressed hers and put them away in a cedar chest. She got them out for an occasional holiday meal. When she took them out after a number of years of being folded and unused, they fell apart in the washer, right along the fold lines. I have the pieces, which have been good for patchwork and small projects. Always use your linens, whether linen or cotton. Never leave them folded when you put them away; roll for storage or hang large items. Enjoy them! Thank you for such wonderful hints. I’m thinking some can be applied to my cross stitch and inherited damask linens. I didn’t know not to use spray starch on items that will be stored. And you’ve given me “permission” to get the damask out of the cedar closet and onto the table. Thank you! Loved the article and hints for those irreplaceable linens. I’ve been collecting and using these for years. If the stains are very well set, I use a Qtip and dilute bleach to spot directly on stain, then rinse thorough;y. This way, the entire is piece is not subjected to the cleaning, rinsing and drying, just the small stained area. I first came across beautiful old linen when I was a small girl and loved secretly rummaging (very carefully! )through a huge drawer at the bottom of my Grandmother’s wardrobe. It was stuffed with lovely old things, carefully wrapped and mostly in white-work, which I later learned were destined for shrouds and had been painstakingly stitched by my ‘ancestors’for that purpose. I have since grown a lot older and I suppose they were all used for their intended purpose but my love for such things of beauty has remained and I have gathered up from second-hand places and car-boot sale and auctions etc, quite a little collection…stored away carefully. I like nothing better than to ‘restore’ a tatty old piece I found for next to nothing and to give it new life. I love your article on caring for and using old linen. Mine is coming out of hiding tomorrow. Thank you ! I have a collection of vintage linens that I use and enjoy about the house. These are in techniques that I love but don’t want to do. I once had to clean a linen (alter) cloth that had been put away after use as a table cloth and had been stained with greasy, spicy food…. normal soaking/hand washing did not move it, nor did a gentle bleach – in the end I washed it in the evening (it was winter), hung it out overnight and let the frost bleach it. It took two or three attempts, from memory, before the stains were completely gone, but gone they were, and the cloth is still going strong some 10 years later. The joys of good quality linen. My mother divided up my grandmother’s linens between my two younger sisters and me. Mine sat in the drawer as I did not want to deal with them, especially ironing them. Since I have no children and my (middle) sister does and she uses the linens she was given, I offered them to her on the pretext that they should eventually go to her children anyway. She also entertains more – both family and friends – than I do. This way they are used and appreciated and I have more storage space. On the other hand, when I was in high school I embroidered a tablecloth. At that time one could go to department stores and purchase needlework to do. The tablecloth was bought at the local Gimbles. It was a preprinted one that one purchased the floss for separately. I did it in blue, red and yellow. It had flowers done in lazy daisy as well as a variety of other stitches. When I was being married some 6 or 7 years later and went to take the table cloth with me, we could not find it. Hopefully it will show up again someday, but since it has been 35 years, I am not hopeful. Years ago I learned about a chemical compound that got nearly everything out of my old prized embroidered linens. It was called sodium perborate, 4-hydrate, granular. 2 Tbls. dissolved in 1 gal. of warm water. Change water after 10 minutes and continue to change water until no longer dark. Rinse well because any residue left on fabric will scorch when ironed. Worked like a charm. The suppliers won’t sell it anymore unless you are a lab. I don’t know much about chemicals but maybe it can be a dangerous compound in the wrong combination or in the wrong hands. I sure wish they would take it off the “list” it is on because I sure could use some more. Nothing like it for old linens. To those of you that like sodium perborate, I sell a product called ‘Vintage Textile Soak’. It contains sodium perborate. I make and also teach classes to make Christening gowns. Most of them are made with vintage lace and eyelet that I have whitened with this product. I like the final color to be a light ivory – which is the exact color an antique white Christening gown will be when it has aged. I don’t have a website, but can sell this product if not available in your area. Totally off topic, but I was so pleased to see your article in Threads on beetle wing embroidery. I know it is here on the website, but I hadn’t gotten around to printing it out so it could sit in front of me while I work. I have they elytra, and I will do it soon! Thank you for a great post, and thanks also to all your readers who added their experience and advice. As the only stitcher of my generation I’ve ended up with the family odds and ends of embroidered linen. I have used some of my linen treasures as window treatments. If you have a small window- perhaps a small powder room- a table runner or dresser scarf is perfect to hang as a curtain. You can attach a ribbon loop at each top corner, and hang from a couple of small knobs from the top of the window. They are generally white and sheer enough to allow light, but privacy. You can also run some cords from the bottom to allow them to be raised and lowered as needed. Makes them appreciated and loved but useful! Mary, I have fallen in love with a product called “Retro Clean” and its companion “Retro Wash”. I have successfully used them to first wash, then soak huge age stains out of several quilts, without any loss of color. I also used them on a vintage skirt which came out like new. I plan to use them on my collection of vintage hankies, (the ones with spots) and expect them to come out beautifully. First you wash with Retro Wash, then soak for several days in the Retro Clean solution, then rewash with Retro Wash to completely remove the soak. (No I didn’t iron the quilts! lol) I have been SO pleased with the results so far. You didn’t mention my favorite cleaning product for old linens – sodium perborate. A friend of mine has worked as a volunteer for Colonial Williamsburg in textiles preservation. They use this chemical for their things. It can be used with care on colored things, even old samplers. It can also be used as a long term soak, as long as a week or two if needed. It is particularly good on those brownish age spots. I did use it once on a piece of embroidery in color and it faded somewhat. You mentioned a product called Restoration which may contain the same chemical. Just remembered another tip. My grandmother used to clean stained linens by washing them, then applying lemon juice to the stains and laying them across shrubs in the sun and let the sunshine bleach them! I use to use Sodium Perborate too but have run out and can’t get a lab to sell me anymore. How can I get my hands on it? I collect old samplers and it works like a charm. I don’t worry about the blemishes on my linens after all I have plenty of age spots, too. I love the dresser scarves that I used on my dresser at home. I search for them in flea markets to cover my book shelves. They are beautiful and deserve to be seen. My great aunt was a Josephite nun and she did amazing embroidery of which my grandmother and mother were often recipients, and when starting my own home took some of her works to enjoy and realized that was something I wanted to try and to collect. So over the last 30+ years I have been collecting (as well as making) embroidery, lace and linens. First from op shops (thrift shops) as that was the only way I could afford to do so at the start (with a young family and not working) moving along to the occasional antique shop and now on ebay. But I still consider my op shop finds the best. I feel as though I am rescuing beautiful work that someone’s family didn’t understand. Yes! I use all my linens and laces! When we bought our first bedroom suite and buffet my parents bought us plate glass tops cut to fit the furniture tops. I found that a great way to display my linens and laces under the glass. If I can’t store an item flat they get rolled onto fabric bolts, they are heavier and longer than from gift wrap or posting tubes, most fabric stores are very willing for you to take what you want, if possible with a layer of acid free tissue between each layer. I have a section of cupboard where I can hang the rolls on a dowel and can remove as required. Two others besides myself mentioned sodium perborate as a great cleaner of old linens. I just can’t get my hands on anymore. Could the 2 other people who mentioned it, get back to me about your sources. I use to get it from a mfg. but they aren’t allowed to sell it to me anymore because I’m not a lab or medical establishment. And to elaborate on how I use my embroidered treasures, and get to see them everyday, I look for big enough pieces with embroidered and cut work and turn them into valences or other style of window treatments. My latest was a gorgeous, long tablecloth that had some damage but I could cut it in half down it’s length, each side for one window treatment. I decided on how much of the length would create the swag part, and the remaining middle was divided in three equal parts and gathered up by using the zigzag stitch over a nylon string. This has the added advantage of being able to adjust the amount of gathering desired once you hang the curtain on the window and see how it drapes and the second advantage is you can let out the gathers to iron it and draw them up again and tie to a suitable length. This was the easiest window treatment I ever made and the embroidery and cut work is gorgeous and shows off when the sun shines through it. I hate to cover my windows because I like the light so these swags are the perfect window treatment for letting in the most light but giving my windows a bit of dressing. I also have a large collection of vintage linens. Mostly tablecloths. As I have collected them, I was not too bothered by the yellowed stains many of them had. But as I have used them and laundered them, I have found that dampening the soiled area and then rubbing a bar of fels naptha around on the stain before putting the cloth in the wash is most effective. I have completely removed stains I thought were permanent. It is completely safe and costs about $1.00 per bar in most stores. Try it, I’m sure you’ll like it. Mary, our altar guild also soaks small- and medium-sized embroidered ecclesiastical linens in club soda to remove wine stains. Club soda doesn’t work well on lipstick stains, though. Great article for the laundry archives Mary! I didn’t see Murphy’s Oil Soap mentioned, so I will add it to your list. This product is especially helpful for cleaning table linens. It has successfully removed stains from vintage napkins & tablecloths, probably because many food stains are oil based. Rub the oil soap onto the reverse side of the stain & let sit for 10 minutes before laundering as usual. While it may take more than one treatment, it does work on both linen & cotton. Winterthur Museum currently has costumes from Downton Abby. One of the lightweight coats is made from an embroidered tablecloth. It has a flowered border with hemstitching edge that outlines the coat, and the ” cuffs” of the sleeves. Terrific info to file away for future use. Thank you Mary! Thank you Karen Johnson for the info on Vintage Textile Soak. Didn’t know about the product or it’s ingredients. What percentage of sodium perborate is listed in the ingredients? If I can’t get it, I’ll need to know how to reach you. I use my treasures linens often in familiar celebrations and so. For rust stains or other persistent stains like fruit stains, wine stains first I hand-wash the linen with a mild soap; then I inspect the all cloth and in the stains i rub soap over it and lemon juice and go into the sunshine. Now and then I dampen not leaving it dry (keep it damp)Sun “eats” stains as it eats colors – i’m speaking about whitework. I try to avoid any chemical products on linen embroidery at all. Use equal amounts of the first 3 items above, using your judgement of amounts depending on how many items you need to cover. Add enough water to mix the 3 items to make up a mixture. A one gallon canning jar with large opening is an excellent container since it permits visual inspection. Add soiled item(s) to container. Cover with airtight lid and leave for 24 hours or longer. Check occasionally and stir or shake. I have used this formula on colorful embroidered items and, while leaving the colors true, it removed age spots. Sometimes it took longer than 24 hours, but this seems to be a gentle way to treat these old items. Hello. I have a large antique embroidered tablecloth (96″ x 64″). It was handmade in Asia in 1935. I had it professionally dry cleaned an the embroidery has shrunk. The tablecloth doesn’t lay flat and it is virtually unusable. Is there anything I can do to fix this? Depending on what type of embroidery thread it is and whether or not it is colorfast, you cojld dry dampening it and stretching it and blocking it. But I would test a small section first, to make sure the colors don’t run. It’s a little risky, but if you can’t use it as it is, as a last resort, I’d try that. If you are going to dampen it, use cold water. I am Norwegian and like many other Norwegians I have a folk costume (a “bunad”). They are not used very often, but most people use them at least once a year, on 17th of May. Very many of the bunads have linen shirts with either white or colored embroidery on the cuffs and collar and some are also embroidered on the chest. It can be cross stitch, white embroidery, blackwork or Hardanger (on the bunads from Hardanger). bunad and folk costume is to wash the shirts right after use, either by hand or in a mesh bag or pillowcase on the gentlest program in the washing machine. Then the shirt should be air dried as dryers wear the fabric more than washing machines. Linen should not be ironed before storing (for a longer period) as this can turn the fabric yellow. The day before you want to wear the shirt, dampen it and wait a while before ironing so the fabric can soak up the moisture. If your shirt has turned yellow they advise to bleach in the sun or on snow, but this should not be done too often as weakens the fibers. I have had my shirt (linen with colored DMC) for 15 years and washed it in the washing machine without any problems. Normally the shirt wears out before the embroidery and the embroidery can be cut off and transferred to your next shirt. 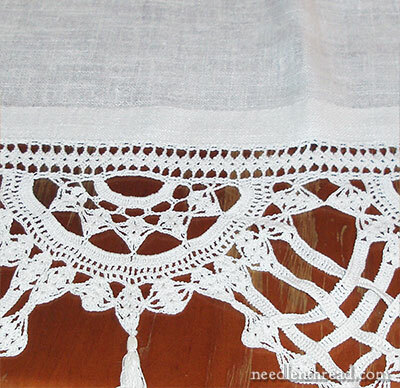 Finally I wanted to tell that we have a linen tablecloth with wool embroidery that my great-grandmother made that we use every Christmas and it is washed on the gentle program in the washing machine and dried hanging from two clothes hangers for skirts (with clips). It is still in very good condition. Thanks for the information, Karen! This is all very good to know! I wonder if you could help me. I have an elderly friend who has asked me to try and locate her two by 3foot x 3 foot supper clothes (large table cloths that she wishes to embroid).. She does not mind what pattern has been traced on it. We live in Brisbane, Redland Bay and I have checked around potential shops here but none of them appear to have what Elma requires. She has been chair bound for approximately 30 years and likes to keep busy with her hands. She has embroidered these cloths for the female members of her family and now wishes to do a cloth for the remaining two daughter-n-laws. A lady at the Pleasure Sew Shop in Capalaba suggested that I contact you to enquire if you might have supper cloths, or advise another organisation that I can try. I would appreciate your assistance in this matter. You might check under “table toppers” and “tablecloths” to see if anything would work. I saw a few there that are on sale – one, I think, was only $5, so maybe you could find a good deal that would offset any international shipping. I googled card table embroidery kits Australia and found a couple of sources on line. A folding card table will be about the same size you are looking for. One source that I saw had cute kits is allthreads.com, but of course there are others and you can find them easier than I can here in the US. Now I think I want to go shopping, too. New stuff is always so enticing. Thankyou for the excellent article and tips. I have both coloured and white embroidered linens that were done by my Great grandfather who was sent from England as a home child in 1891 at age 11. He lived to 96 and took up embroidery in his later years. Unfortunately some if the items have damage (holes) in the linen. I remember watching him me them and I had some in my bedroom (dresser scarves) I would like to restore them or use them in somethings like quilts I can make. I also have tatting done by a grandfather and laces by my grandmother. I have embroidered doilies and Poreciate all the work in them.All these items are quite old as J am now past 60 myself. My 8 yr. old granddaughter has a keen interest in doing handwork and sewing and am sure she will like some if these items to cherish some day. Such good tips, Mary. Handwashing makes such good sense, but I’m also lazy at times and will put some of my Battenberg lace in with a load of sheets or towels then press them after taking them out of the dryer. It does shrink them a bit, but at least they are not dry rotting in the closet. They also make beautiful pin cushions. And I have also made a couple of quilts for people who wanted to preserve their family embroidery work, but didn’t have a use for the table runners and doilies. I appliqued them onto a plain base fabric so they stand apart from the white linen. Not difficult to do, but a new way to enjoy the work as the top on a bed. This also preserves the beautiful lace edgings as well.